My poems “After” and “The Selkie Visits the Beach (Six Months After Losing Her Pelt)” were just published in Grievous Angel. On the subject of poetry, my “Mama Gonna Fight” poem in March’s Apex Magazine was well-reviewed at Quick Sip Reviews..
Now to something else that’s nifty. 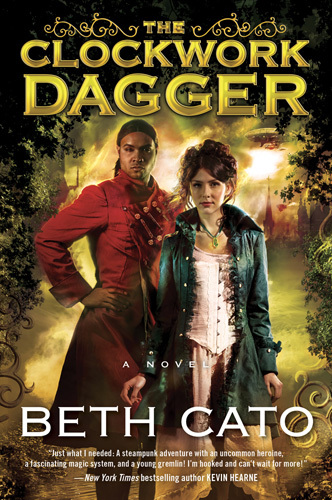 I mentioned a while back that Locus Magazine had The Clockwork Dagger on their short list of best 1st novels for 2014. Well, it’s now time for people to vote for the annual Locus Awards, and as a recommended read, my book is already included on the ballot. Every April and November I take part in the Poem-A-Day Challenge at Writer’s Digest’s Poetic Asides Blog. It’s when I complete the bulk of my poems for the year. This April, I’m going to do things differently. First of all, I’ve been so busy that I 1) haven’t had the chance to edit all of my poems from November, and 2) I haven’t been able to submit as much poetry, either. Therefore, I don’t really need to create more of a backlog. I do have an immediate need to write certain kinds of poems, though. 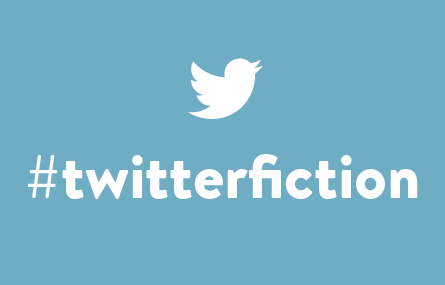 In May I’m taking part in the #TwitterFiction Festival and I need a large stockpile of tweet-sized stories and poems. I figured, hey, I’m going to be getting poetic prompts every day through April. I can use these for a new purpose. I already have some works written but I’m depending on these April prompts to push me along every day. I’ll post more about the #TwitterFiction event as it nears so that you can follow along! The original version at Mom on Time Out looked pretty darn amazing to start, but as usual I decided to improve something by adding 1) Biscoff spread, and 2) Oreos. These things will blow your mind and your waistline. Imagine dense bricks of caramel and goodness. I stored these in the fridge–because I live in Arizona and even at room temp chocolate goes too soft–and to my surprise, these bars didn’t harden. Nope. Even chilled, they were chewy and amazing. 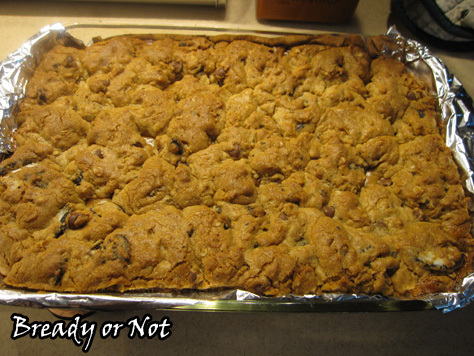 The Biscoff probably helped with the soft and chewy aspect. 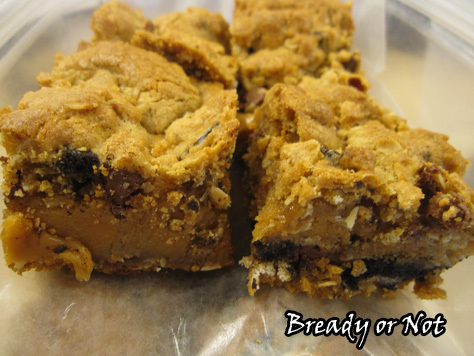 Of course, you can also make this using any nut butter instead of the Biscoff spread, or substitute another cookie for the Oreos. Mix it up. 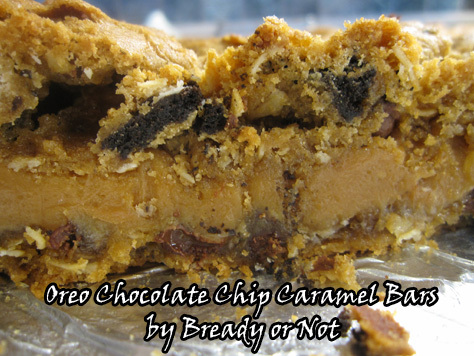 So many things pair well with a thick layer of caramel. Make these. You know you want to. Modified from Mom on Time Out. 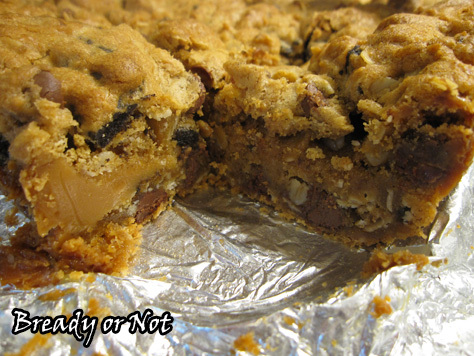 Dense, chewy bricks with a thick layer of caramel in the middle. A calorie bomb of sweet perfection. Preheat oven to 350 degrees. Line a 9x13 inch baking dish with parchment paper or aluminum foil, and butter or use nonstick spray. Chop the Oreos and set them aside. Place caramels in a small saucepan with butter and sweetened condensed milk. On medium-low heat, stir often until caramels are melted and mixture smooth. Set aside. In a large mixing bowl, cream together the butter and sugar. 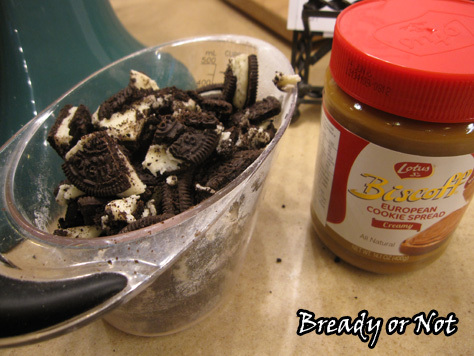 Add the Biscoff spread (or nut butter) and mix. Add eggs and then vanilla, and mix well. Combine the dry ingredients: flour, oats, baking powder, and salt in a small mixing bowl. Slowly pour the flour mix into the large mixing bowl. Stir in the chocolate chips and then the Oreo pieces. Drop about 2/3 of the dough into the prepared casserole pan and smooth it out over the bottom. 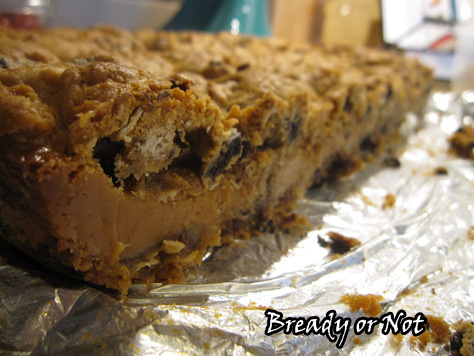 Slowly pour the caramel mixture over the dough and spread out to the edges. Dollop the rest of the dough on top; don't worry about covering all of the caramel. Bake for 28-32 minutes. Cool completely and then cut into bars.